Could an Apple TV be Coming as Early as This Fall? It’s the rumor that just refuses to die. 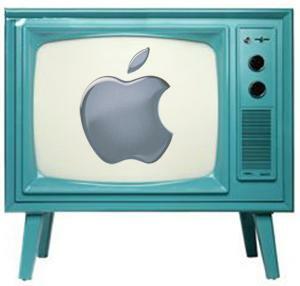 Once again the story that Apple is preparing an actual Apple Television – can’t really call it Apple TV as that product already exists – has shown up around the blogosphere. This rumor seems to pop up every few months like clockwork, the last time being back in April. However, this time there is a new twist that makes me think we may be looking at this concept from the wrong angles. According to a report from Daily Tech, a former Apple executive has told them that an Apple television is coming as early as this fall, or possibly early next year. The executive, who of course wished to remain anonymous, says that Apple is teaming up with a major television manufacturer to rebrand certain models under the Apple logo. Daily Tech takes a guess that it’s Samsung, but we have to add we think that is next to impossible considering the bad blood and lawsuits currently flying between Apple and the Korean company. Sony also seems unlikely as they are partnered up with Google currently on their Google TV project, but that still leaves a ton of companies out there. A lot of pundits are pointing out how expensive Apple Cinema Displays are, and that the iMac has not progressed past the 27-inch mark as evidence that Apple isn’t ready to do the 42-inch and greater screens it would need to make a splash in the world of televisions. And they’re right, considering the premium Apple places on its products, I shudder at the thought of what a 55-inch, all Apple television would set a person back. But what if it isn’t actually an “all Apple” television? What if it’s a hybrid? Television manufacturers have gotten all excited about apps as late, with Samsung in particular really pushing their Smart TV line. Now imagine if Television Company X could come out at a presentation and say, “We’re partnered with Apple to bring the wonders of their iOS operating system to your TV.” You can also imagine your iPhone, iPad and iPod Touch would turn in to controllers for the system as well. Going this route Apple gets to avoid the headaches of jockeying for shelf space in retail stores, they can bypass having to deal with a whole new product line, they get to collect a nice royalty check for the Apple logo being placed on someone else’s product and they get to collect a ton more revenue from app sales. It would be a win-win situation all around. The one hiccup, however, is that Apple CEO Steve Jobs despises this business model. That is why the company goes after anyone that tries to sell Mac OS X on any computer not made by them, they simply hate the licensing business model. The problem is that if Apple wants a piece of the huge wallet that living room tech is becoming, they need more than the little Apple TV set top box to do it with, and making their own televisions could be a gigantic headache. Slapping the system into someone else’s television set would be the easiest way into the living room, but can Jobs let go of his controlling ways enough to let it happen? I fear that he can’t, but it would be something to behold if he did. What do you think? Could Apple finally be coming out with their own TV? Could they finally allow someone else to release a product with their logo attached to it?